This is the first of our two part series on the recently released Statistics Canada report on the income of immigrants. 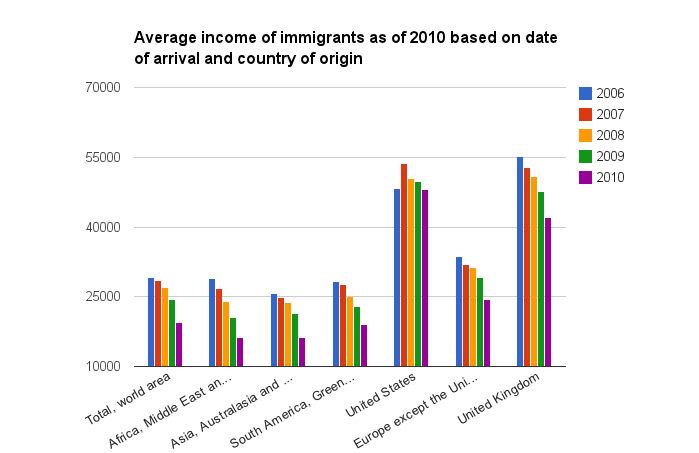 We analyse income trends for immigrants from different regions of the world who arrived between 2006 and 2010. 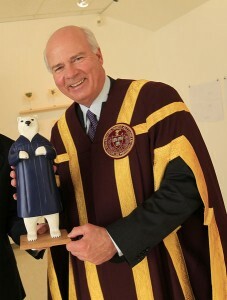 The second part of this series can be found here. Data released last month by Statistics Canada shows large variance in the average income of immigrants across groups divided by country of origin and date of arrival in Canada. The data looks at income-receiving immigrants from six geographical regions: 1) Africa and the Middle East, 2) Asia, Australasia and the Pacific 3) South America and Greenland, 4) the United States, 5) Europe except the United Kingdom, and 6) the United Kingdom. It tracks the immigrants’ incomes from 1980 to 2010, to find trends in income growth over time. In this report, we look at the 2006 to 2010 period to analyze the income growth of recent immigrants. The results, seen below, show incomes rising as an immigrant’s time as a permanent resident in Canada increases. For the newest cohort – those who arrived in 2010 – the average income was $19,548 in 2010. For those established in Canada the longest, since 2006, the average income as of 2010 was $29,151, a 50 percent advantage relative to the most recently arrived group. 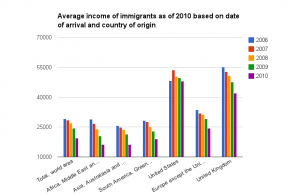 Among different world areas, immigrants from the United Kingdom had by far the highest average income. Those who landed in 2006 had an average income of $55,081 by 2010. Immigrants from the United States followed, with those who had arrived in 2006 earning an average of $48,345 by 2010. The remaining regions saw much lower average incomes, which were closer to the average income for the total immigrant population due to the fact that their members made up the majority of immigrants to Canada over the period. Immigrants who had arrived in 2006 from the African and Middle East area, the Asia, Australasia and the Pacific area, and the South America and Greenland area, earned on average $28,944, $25,694, and $28,173 per year, respectively, by 2010. In the middle of the pack were immigrants who had arrived in 2006 from the ‘Europe outside of the United Kingdom’ area, who earned $33,564 by 2010. The data confirms previous findings that link proficiency in an official Canadian language and knowledge of Canadian culture with better economic performance for immigrants in Canada. Canada’s immigration programs have been reformed in the past year to place greater emphasis on language ability, in order to select immigrants more likely to successfully integrate into Canada’s economy and labour market. please provide me the updated immigration news.